Born at Lowe Farm in 1928, son of I. J. Warkentin, he received a Bachelor’s degree from the University of Manitoba in 1948 and a PhD from the University of Toronto in 1961. 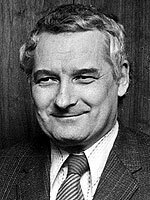 He was an Assistant Professor of Geography at the University of Manitoba, engaged in research on the settlement and regional geography of Western Canada until 1963, when he became an Assistant Professor at York University. He taught at York until retirement in 1993. He is the author of The Western Interior of Canada (1964), a volume in the Carlton University Series, and co-author with Dr. Richard I. Ruggles of the Historical Atlas of Manitoba, published in 1970 by the Manitoba Historical Society. He is a Fellow of the Royal Society of Canada, and an Officer of the Order of Canada. Reflections of Lowe Farm, 1899-1999 by the Lowe Farm History Book Committee, page 236.